This review is about item#6731356. Although it might be such a thing, I felt that the lateral slippage of the upper and lower blades was large. Although it may not matter much if it is pinched. This review is about item#6731347. When I went to a sheet metal shop, I saw something similar, I bought it immediately because it was cheap with a monotaro. It was good as I wanted it for a long time. I think that it is making more than the price. In case of stopping strongly, we use other types, so it was good if we had a little longer beak. I wanted a small type and ordered it. Although it can be used, the tip is misaligned and it is difficult to use. 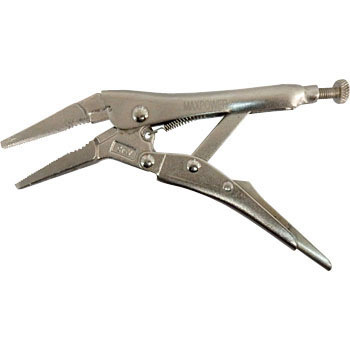 Buy the first vise pliers! I bought it to grasp the hose and plastic screws in the back. Somewhat small one feels dangerous, but it is a plain that is easy to use. liked it. It was good at cheap and fast delivery. There is no functional problem. Because it is Sokosoko because it is individual usage, I purchased this product cheaply and I am satisfied enough.